Vesuvanite Gemstone Pyramid for Sale. 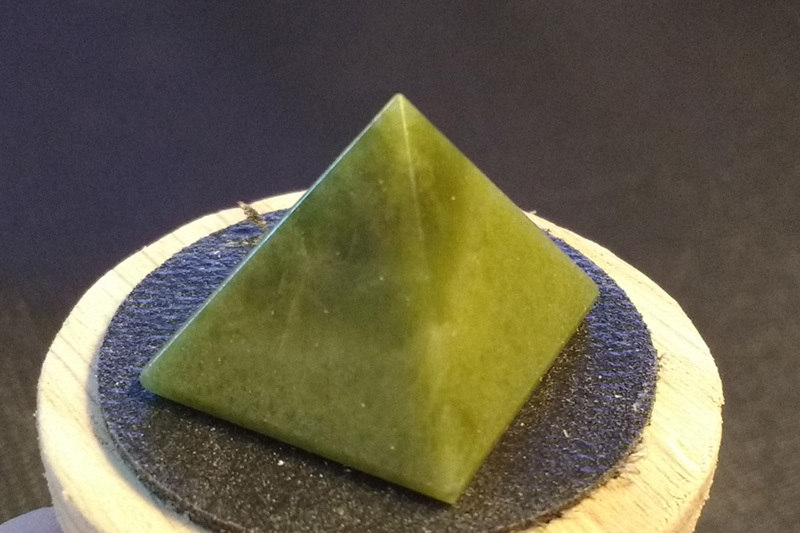 Small Vesuvanite Gemstone Pyramid as Capstone for Copper Meditation Pyramids. Heart, All Chakras. Vesuvianite brings us closer to the higher realms and provides an easier link to our sense of higher self (crown). It facilitates the seeing and the understanding of things on this earth that have no substance. Psychologically, Vesuvianite releases feelings of imprisonment and restraint, dissolves anger and alleviates fear and negativity. It helps to create a sense of inner security, opens the mind and stimulates inventiveness and the urge to discover, linking into creativity. Vesuvianite banishes depression and clears negative thought patterns so that the mind can function more clearly. Physically, Vesuvianite strengthens the tooth enamel and restores the sense of smell. It also assists in assimilating nutrients from food.